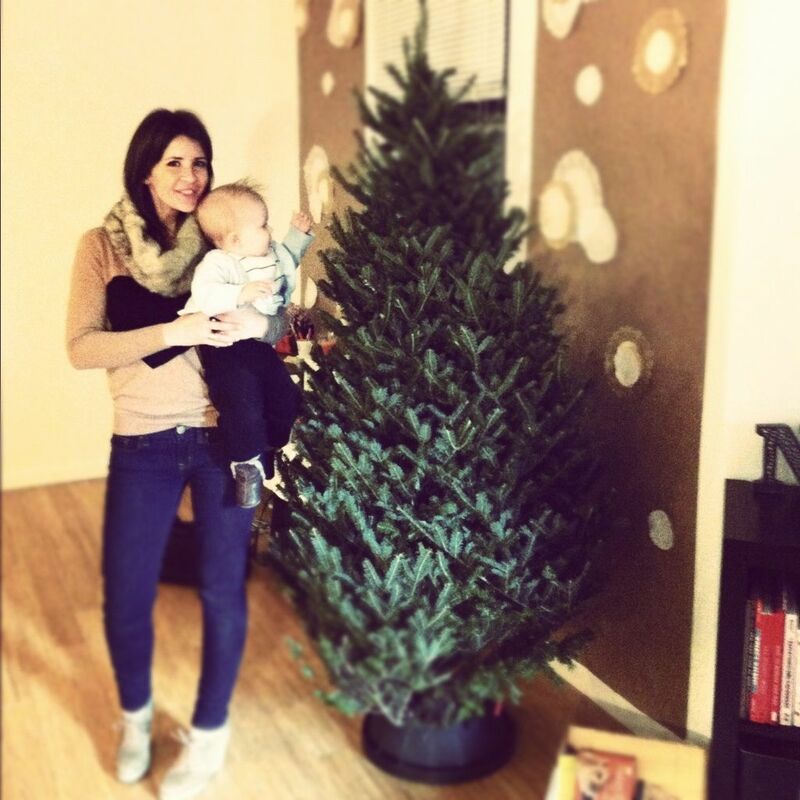 HEY NATALIE JEAN: HOW LOVELY ARE THY BRANCHES ANYWAY? on friday morning, after a breakfast of street completos (sooooooo goooooood), we set about the very important and spiritual task of finding the tree. we looked and thought and looked and thought, and then we found her on a little tree lot on broadway. i liked her from the minute i saw her. but was she the tree? 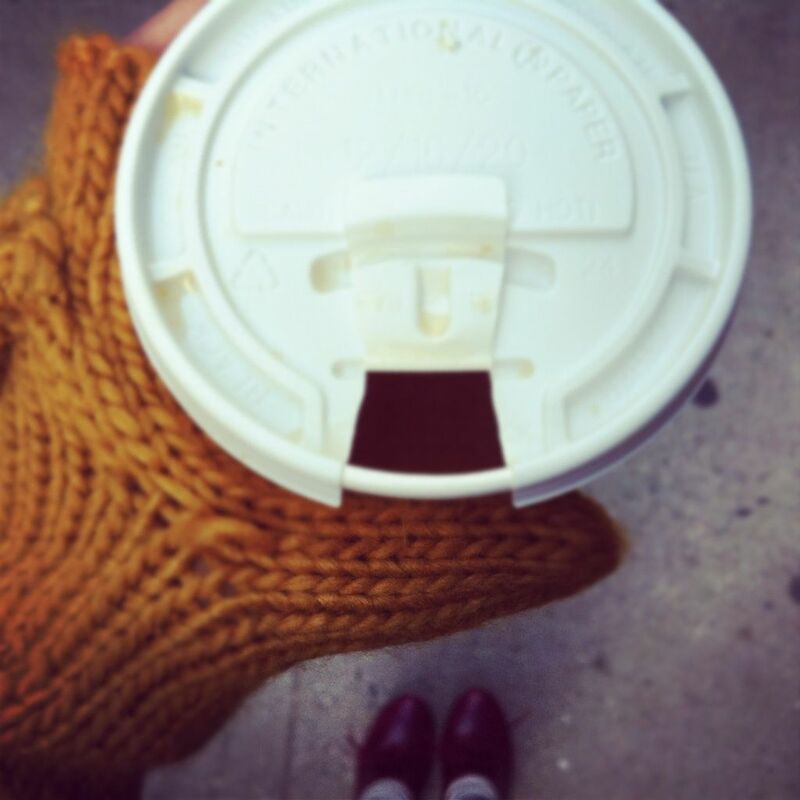 i had the tree man set her aside while we went for cocoa and cider so i could ponder things properly. finally i was certain, so we plunked down the cash and hauled her home. hauled her home fifteen blocks you betcha. she is up and she is lit and she is lovely. ornaments are nearly all in their places, and i am just about finished knitting her up a real nice tree skirt. and as i knit knit knit i can't help but reflect on my very thorough and abiding feelings regarding the decorating of christmas trees. christmas trees are fascinating, don't you think a christmas tree just says something about a person? i asked a few of my friends to share their christmas trees, as well as their tree rituals and theories, and i'll be posting them here throughout the month of december. i'm super excited. 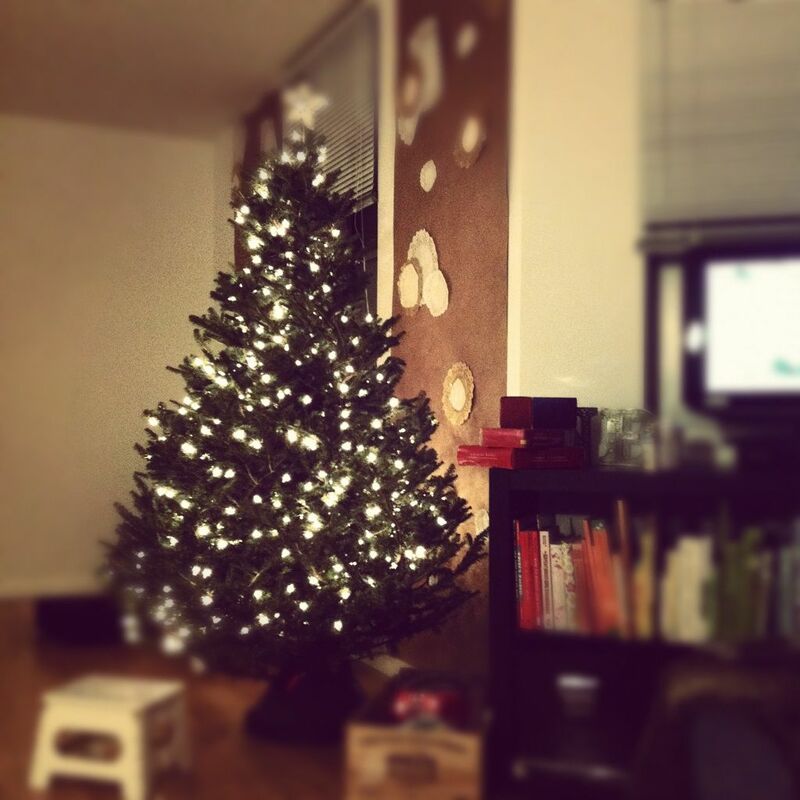 in the meantime, internet, i'd like you to meet my tree. i call her shirley, after my crazy granny goose, because she is a fussy old broad. grand unveiling of shirley in all her glory to come soon. why, just a bit ago i swear i saw her screw her mouth to the side and look at me with that look. would you care to share your christmas trees with us? i'd love it if you did. it just might make the blog! 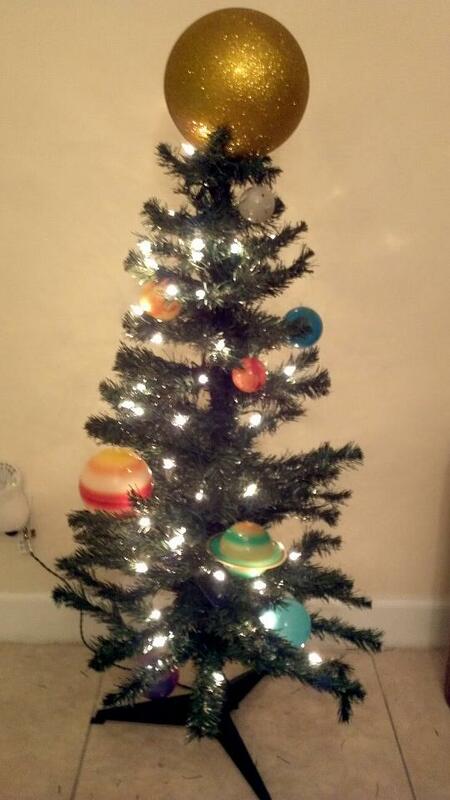 Did you see this amazing tree, using solar system decorations? I love it! cute!!! i love that planet topper! I am definitely emailing you! :D I love your tree stories! How fun! I think that Shirley is a wonderful tree. :) Even if she does give you knowing looks. haha! i love christmas. she's a pretty perfect tree, that one is. Your tree looks fabulous! 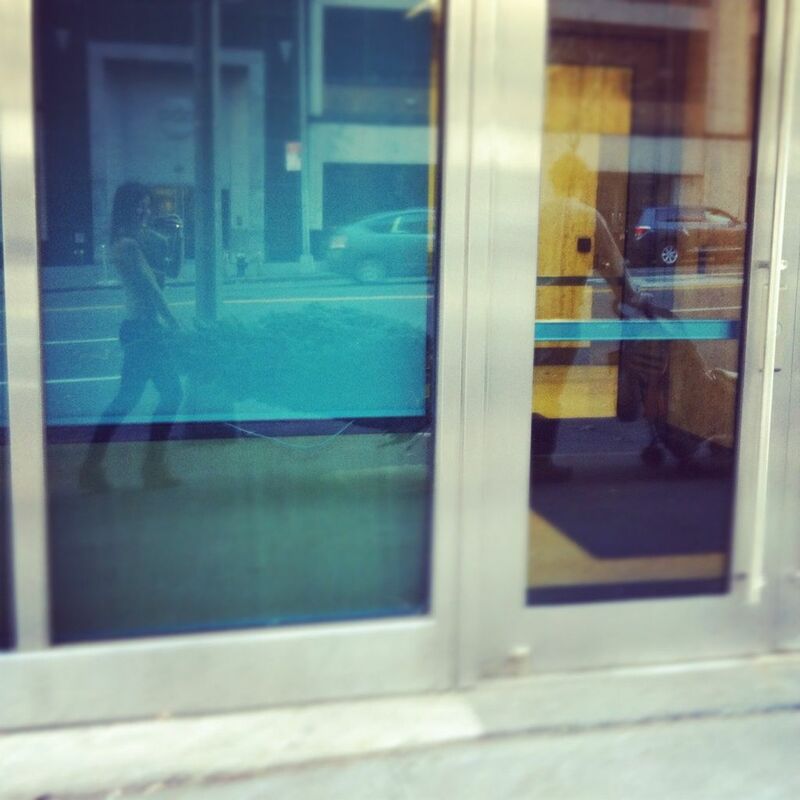 And I so love that you can hold up your end of said tree on a busy New York street, hold your gorgeous hunk of baby, and take a picture of the reflection in a window all at the same time! You ROCK!!!! She's perfect! Also, please send me your gloves. Thanks. This is such a cute idea Nat! I love hearing about other people's traditions. We are getting our tree this weekend, so I can send you a picture then. But I have one funny story for you to go along with it! Let's just say the first real fight of my marriage was about christmas tree lights! Who knew people had such differing holiday opinions? Also, it could be an interesting post to talk about if you and the Holbs had different attitudes about holidays. I am surprised at how different my husband's holidays were than mine (religion wasn't even a factor, just different traditions) and how you are forging your own traditions as a family. Just a thought. Can't wait to read the stories! I miss real trees. I was told I am not allowed to have one due to the fact that we live in a very old house and real trees are a fire hazard supposedly... Fake trees just aren't the same. The tree is stunning! I can't wait to go home and see the tree my family picked out! gosh dangit there is just too much style oozing from you, it unfair. I love your past trees and I can't wait to see what you do with this one! We'll be decorating our tree tomorrow night. I can't wait! Your tree is very, VERY lovely. What I'm interested in, is the fact that it appears the Mindy Gledhill doilies have found a permanent home on your wall. I love your tree, beautiful, but I'm having a hard time moving past the pronoun dudette. I've always thought of my tree as a he. Maybe I've always just ended up with he trees. Maybe there is a whole world of she trees I've been ignoring. Huh. 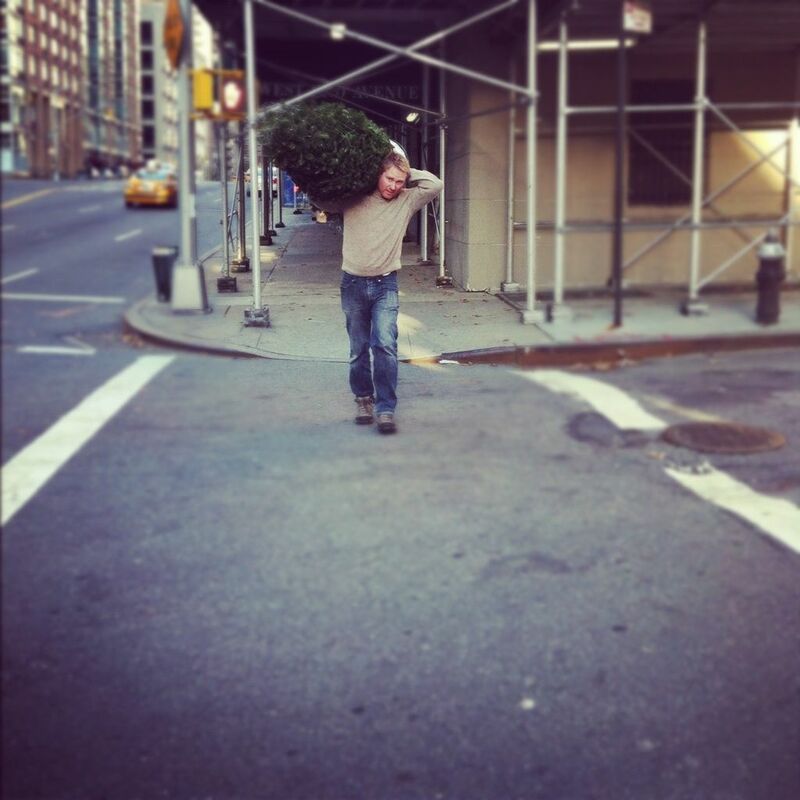 I love the idea of living in a big city and having to carry my tree so many blocks home. Probably more romantic in theory than practice. Tell me I'm right so I can let go of that dream. I'm digging the lights you put on Shirley! Did you use 2 or 3 different sizes? I love that her name is Shirley. She is lovely. We always had a fake tree growing up, and though I longed for the smell of pine, it was always beautiful: meticulously lighted and covered with memories. My fam has a tradish where we get an ornament each year to represent the most significant event - marriages, grandchildren, new cars, the Minnesota Twins winning the world series... so it's always a fun night when we talk about those particular ornaments and put them on the tree. did you buy that sweater after joanna posted it? haha. me too. also, what a body on that tree (whistles and hoots)! She is a sweet and sassy tree, that Shirley of yours. Love the picture of you guys carrying it home! Fabulous. Just fabulous. Love it all. You are my hero Nat! Beautiful tree! Makes me think I should have bagged the fake tree and gone real this year. 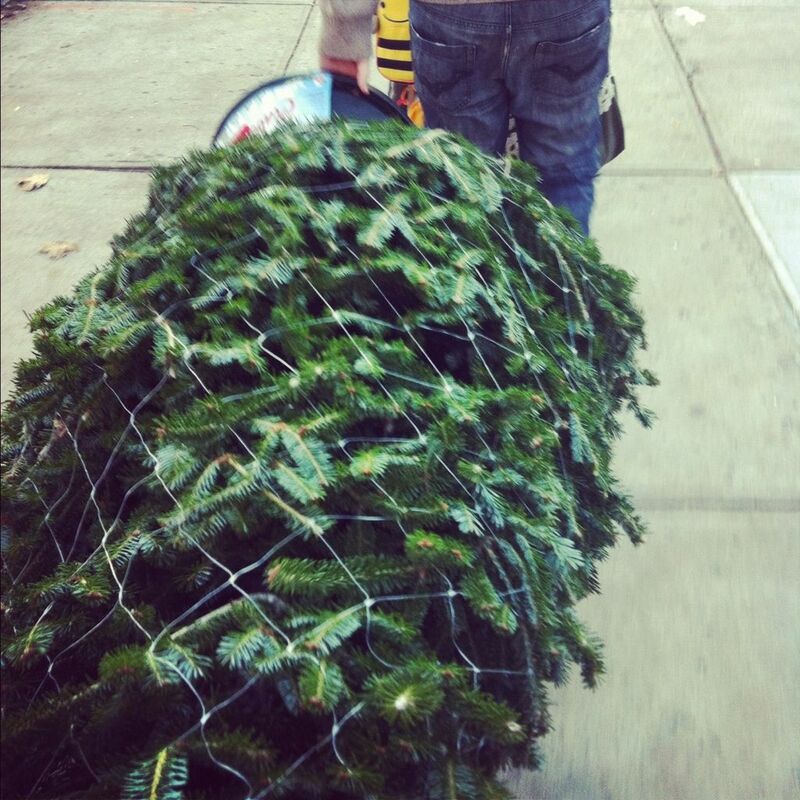 oh man, the picture of your reflection, carrying the tree is just adorable!